Get to know the particulate numbers. In hydraulic systems, there are several components that rely on a single source of fluid. It is important to know the cleanliness requirements of all components in so that you can meet the ISO requirement for the most sensitive component. Example: Among many components, a given system may have a servo valve 16/14/11, a vane pump 18/16/13 and a cylinder 17/15/12 (codes based on industry standards). The most sensitive component in the group is the servo valve. The ISO cleanliness code of 16/14/11 or better is the target for this system. The two most common methods of calculating your fluid’s ISO code are the laser particle counter [https://www.hyprofiltration.com/products/fluid-analysis-and-monitoring/] and the vacuum patch test (aka black and white pull down test). Directly connecting an online laser particle counter to the hydraulic system through sample ports provides the most accurate analysis of the cleanliness as it provides the exact ISO count with little effort. The vacuum patch test kits include pictures of patch samples at various ISO codes and you, via a microscope, visually match your patch to closest ISO rated sample. It’s actually sort of fun, but requires more effort and is more ambiguous that the laser particle counters. An added benefit of the vacuum patch kit is that it can help you identify the source of contamination based on the material viewed via the microscope. Don’t have either? No worries, we can do either test for you here in our York, PA location… Contact Us! You know your target ISO Code and your fluid’s current ISO code, so now what? We can use the Recommended Target ISO Code chart above to find the recommended filter micron size for the ISO code and Component. For example, suppose the most sensitive component in your system is a variable vane pump that requires ISO 18/16/13, and your fluid’s ISO is tested at 22/20/17. 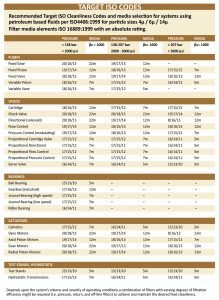 You should change your filter to a finer micron, but which micron rating should you choose to meet your target ISO Code? Using the [FIGURE 2] chart above we can see that minimum recommended micron value for a system running at 2,500 PSI is 7 micron (at beta 1000). Adding a high-quality filter that is 7 micron or better should bring your fluid to your ISO target. Make sure the filter elements you are using have an absolute beta rating (see Understanding Filter Beta Ratios). Unless you are buying filters at an auto parts store, your hydraulic filters should be absolute rated. Absolute rated elements allow you to trust that the quoted beta ratio is accurate and verified. Use a highly Beta rated filter. A 1000 Beta rated filter has a much higher efficiency than lower rated filters and will “stop the cycle of wear” in your systems. Use a reservoir desiccant / filter breather and make sure your reservoir is sealed to reduce outside dust and moisture contamination. Verify that your filter is sized properly. Improper sizing can reduce element life and increase system pressure drops. Review your system for other stress factors including, but not limited to, flow rate changes, pressure changes, cold starts, high temperatures and environmental changes like dirt and moisture. Consider adding an off-line system, like a kidney loop or filter cart, to reduce contamination in the reservoir so that ISO target cleanliness levels can be reached more quickly. Advanced Fluid Systems does recommend that reaching a target ISO one code number lower than suggested in the chart above. This could mean the difference between one particle exceeding your target or thousands. Let’s look at our target 18/16/13. The 4 micron values should not exceed 2500 particles per milliliter [see FIGURE 2]. 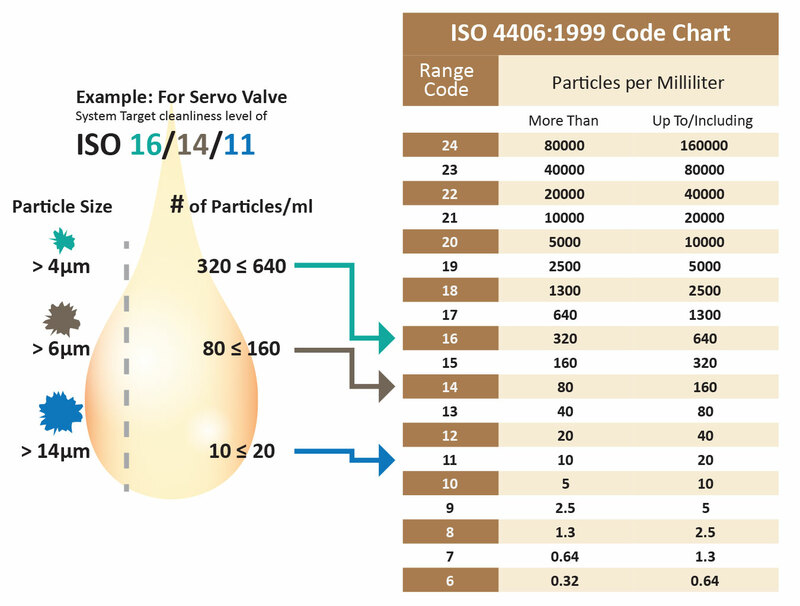 A single number increase in the ISO code can mean a two to four times particulate ingress. In our example, the 4 micron ISO value of 18 could be as low as 1300 ppm and 19 could be as high as 5000 ppm – a 3.8 times difference. Maintaining lower ISO codes are easy to achieve and can significantly extend the life of the system. Once the ISO cleanliness level has been reached, it now should be easily maintained with proper preventative maintenance and monitoring. 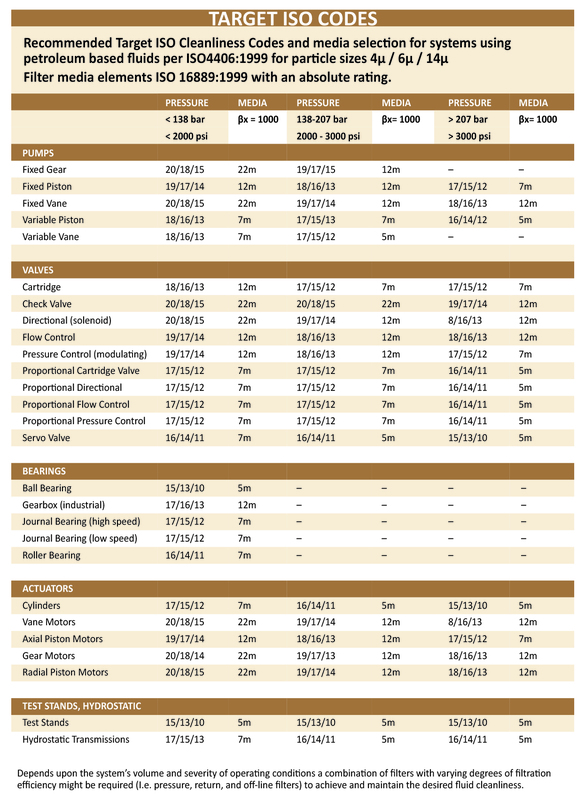 Want to learn more about your fluid’s ISO cleanliness? Contact Advanced Fluid Systems for a FREE assessment. We’ll help you identify any potential issues and get you back on target.